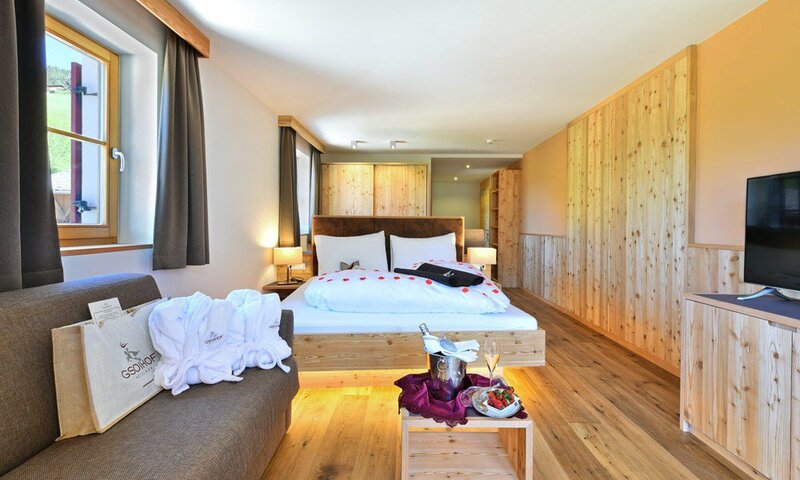 Are you looking for a hotel room in South Tyrol with a special flair? 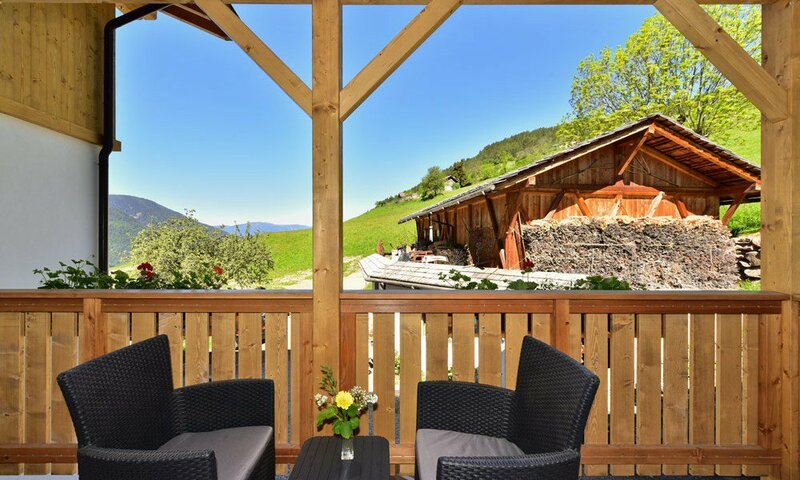 We offer you a comfortable accommodation in Villnöss, which is according to your wishes in terms of location, atmosphere and comfort. 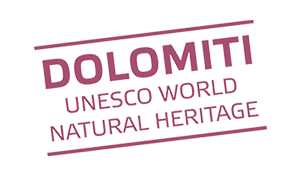 Due to its scenic beauty, our valley is one of the most popular holiday region of South Tyrol and offers a variety of possibilities for active tourists. As a guest of our house you live in the middle of a unique holiday idyll. And our farm hotel with its history dating back to the 13th century surrounds you with a traditional ambience and cordial hospitality, so that you will immediately feel at home. 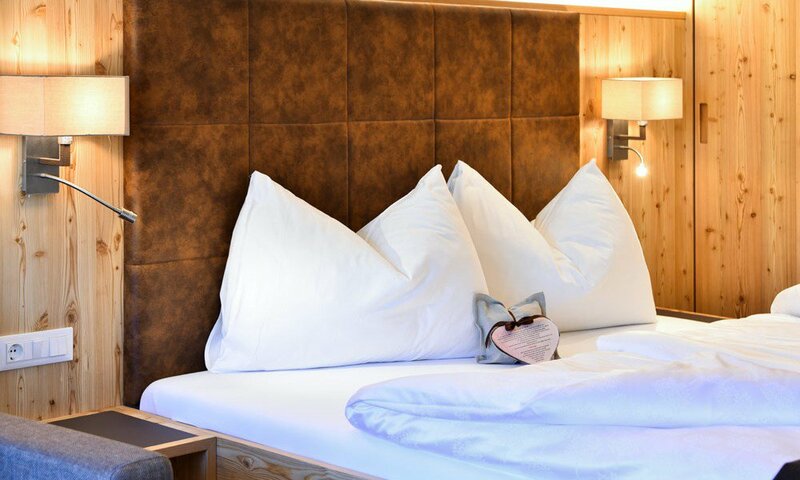 Our newly renewed hotel waits for you with many nice double rooms and suites, one of which surely meets your individual needs. Our 10 generous double rooms have a size from 26 to 28 m2 and are oriented towards north-west and south. 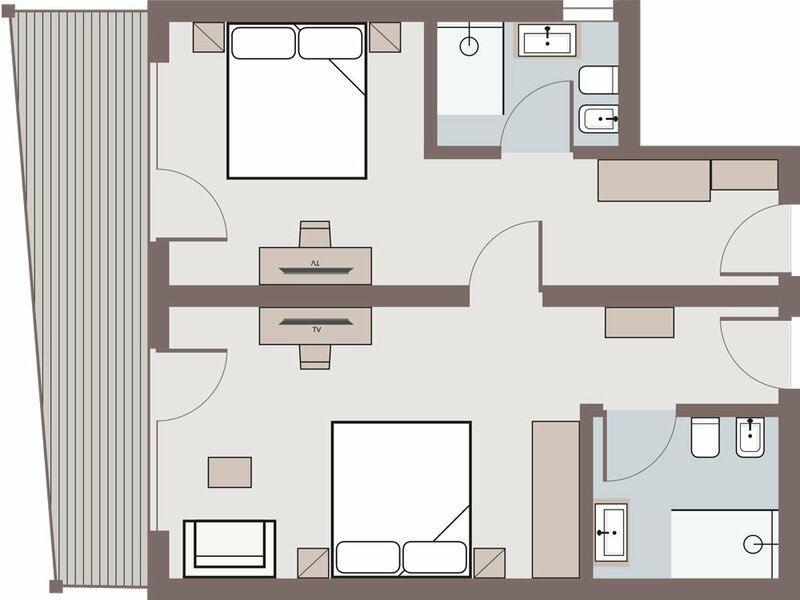 Even more living space for a carefree holiday is offered by our south-facing 2 Gsoihof suites with a surface from 32 to 36 m2. If we combine our double rooms upon your request, we will be able to create generous family suites with approx. 50 m2. These, like all rooms to the north-west, have garden terraces. 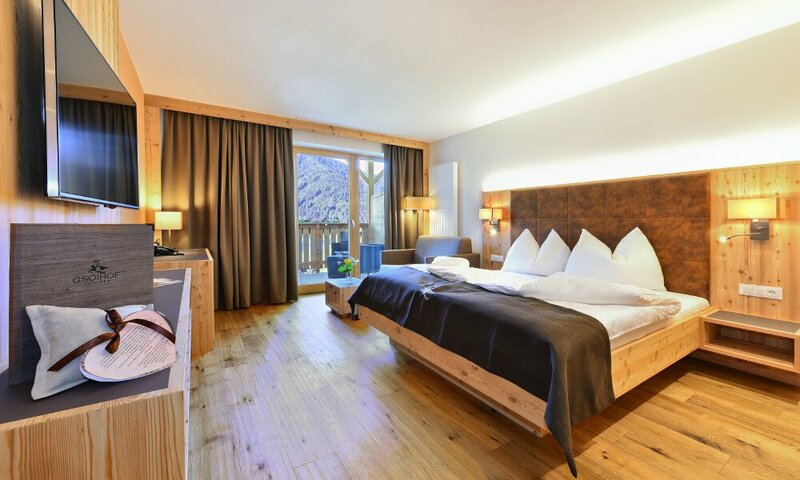 The other rooms have balconies with a fantastic view of the Villnöss valley and the Geisler peaks. 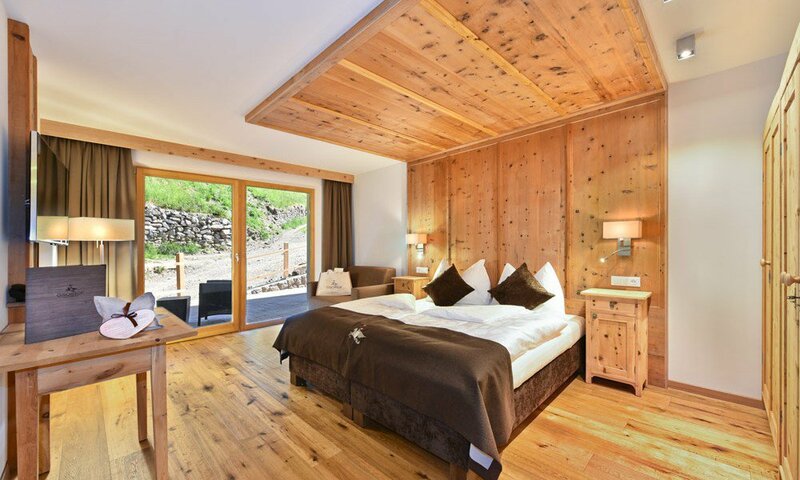 The spacious double room “Geislerblick” offers an exclusive accommodation on 27 m2 – It faces south and fascinates with a breath-taking view of the Odle Peaks. The high-quality natural wood furnishings in alpine larch, as well as the parquet floor in oak combine in a harmonious colour design and clean lines to a charming ambience with alpine tradition and modern chic. Room amenities include a flat-screen TV with satellite channels, WIFI, in-room safe, a desk, and a comfortable sofa that can be used as a full extra bed. 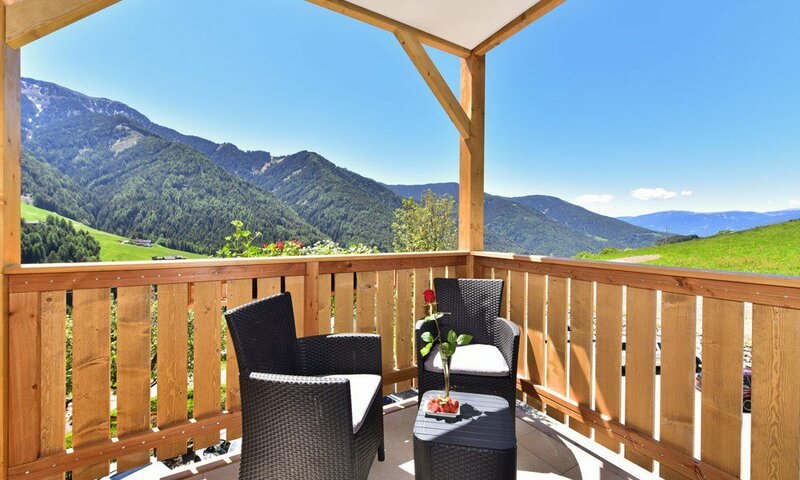 From your private southern balcony, you may enjoy the view from the Odle Peaks to the Funes Valley, into the country all the way to the Corno del Renon. Each bathroom has a shower (some have a bath tub), WC/bidet, hair dryer, and convenient storage areas. 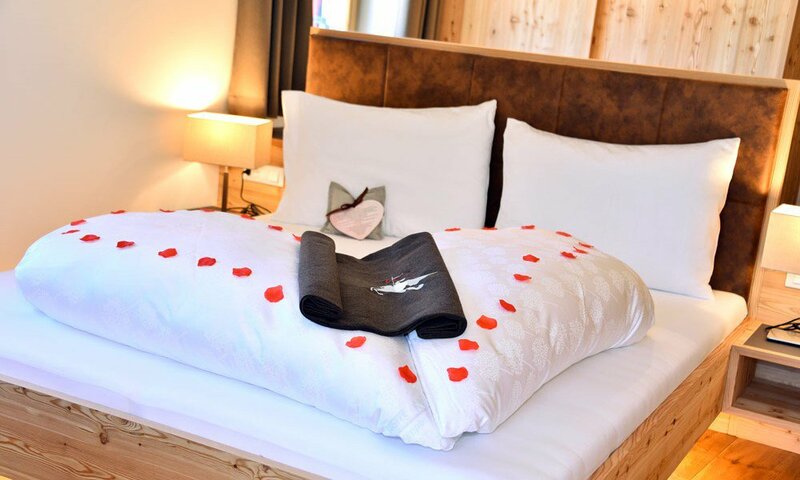 The double room “Geislerblick” offers plenty of space for up to 4 persons. 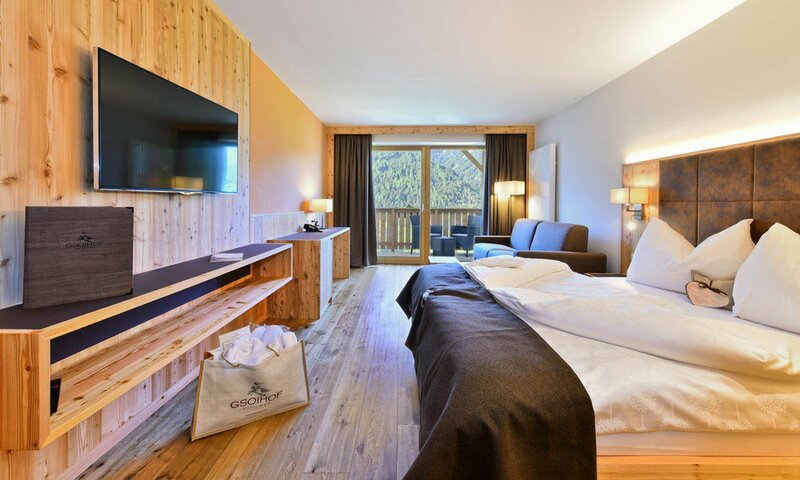 In beautiful southern location, with a view on the Odle Peaks, this particularly spacious accommodation (38 m2) offers a special living ambience – The Gsoihof Suite is a truly unique alpine vacation experience. 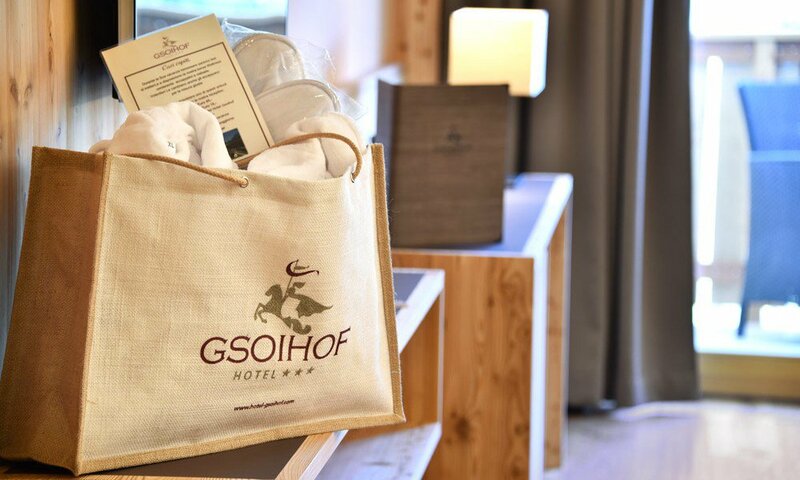 High-quality natural wood furniture in alpine larch, parquet flooring in oak and a harmonious light and colour design give the Gsoihof Suite upscale living comfort and tangible harmony. 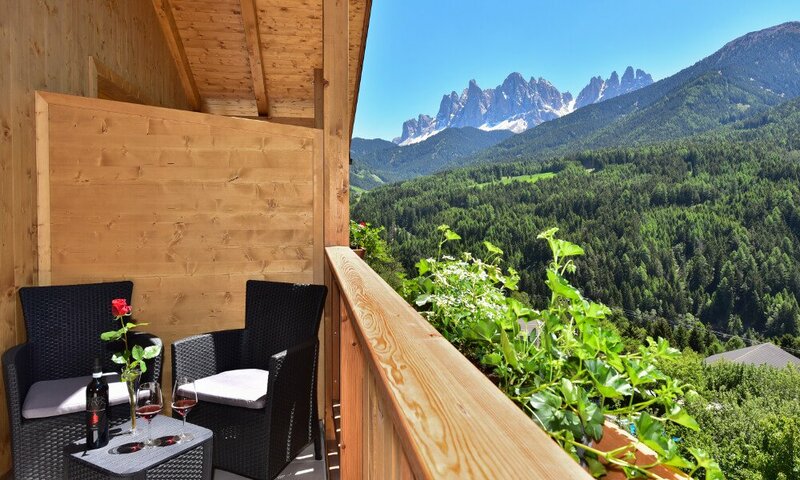 From your private balcony, you may enjoy the view on the Odle Peaks and the idyllic Funes Valley. The room amenities include a flat-screen TV with satellite channels, WIFI, in-room safe, and a desk. The comfortable sofa can be used as an extra bed. 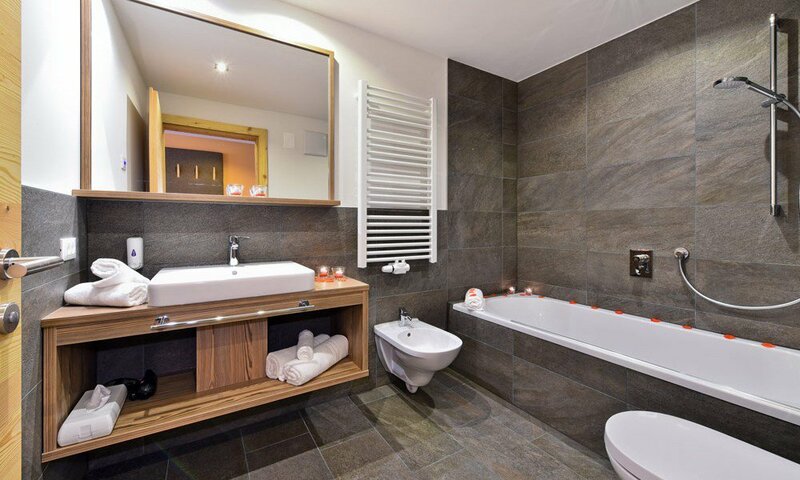 The spacious bathroom is particularly suitable for guests with reduced mobility. 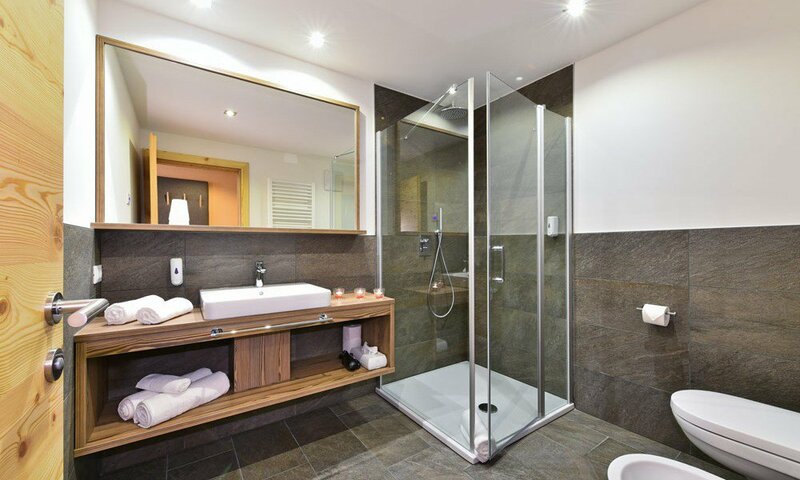 The bathroom features a shower, WC/bidet, hair dryer, bathroom furniture with generous storage space, and an exterior window. 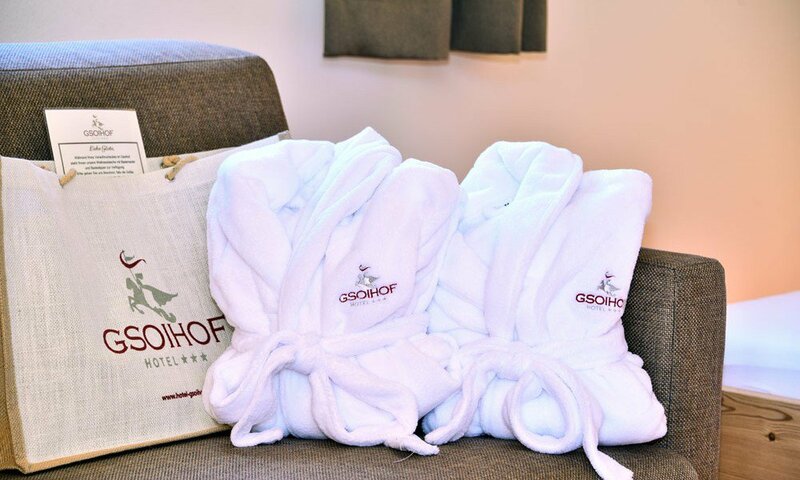 The “Gsoihof Suite” offers plenty of space for up to 4 persons. 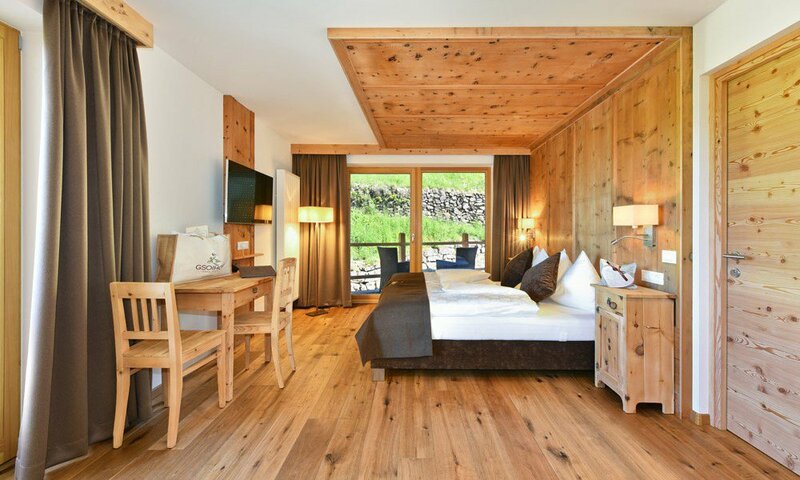 The wall panelling with alpine lounge flair in the double room “Funes” emphasizes the alpine character of our valley and the tradition of the farm Gsoihof. Alpine materials – such as larch wood furniture and natural wood parquet in oak – are combined with contemporary comfort, creating an exceptionally pleasant living ambience. 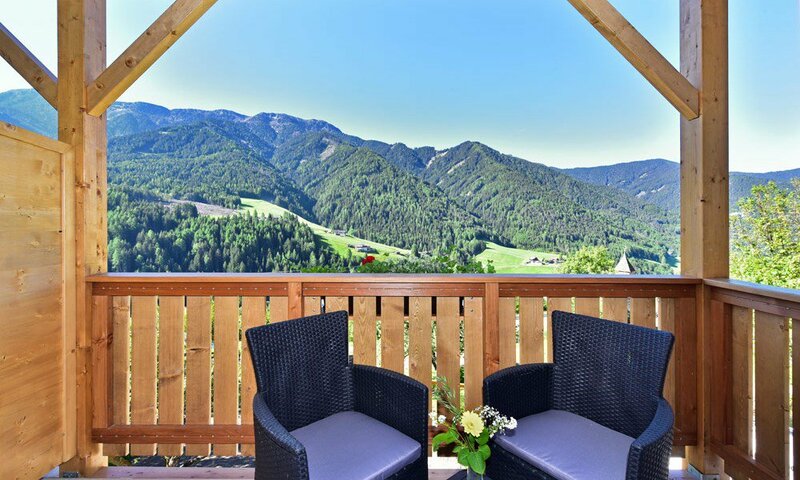 The highlight of the west-facing rooms “Funes” is a private terrace, where you may enjoy the view of meadows and forests and – especially in the summer months – the evening sun. Room amenities include a flat-screen TV with satellite channels, WIFI, in-room safe, a desk, and a comfortable sofa that can be used as a full extra bed. The bathroom has a shower, WC/bidet, hair dryer, and convenient storage areas. The Family Suite with 2 bedrooms and 2 bathrooms is the ideal choice for your family vacation. It is also ideal for couples with different sleeping habits. Via a connecting door, the bedrooms can be completely separated or just connected to each other. For families with children it is particularly advantageous that the Family Suite has a terrace and direct access to the outdoor area. The high-quality interior design with traditional panelling, larch wood furniture, and natural wood parquet in oak give the Family Suite a charming alpine flair. The room amenities include a flat-screen TV with satellite channels, WIFI, in-room safe, and a desk. Furthermore, each room also has a comfortable sofa that can be used as an extra bed. Thus, the family suite can comfortably accommodate up to 5 persons. 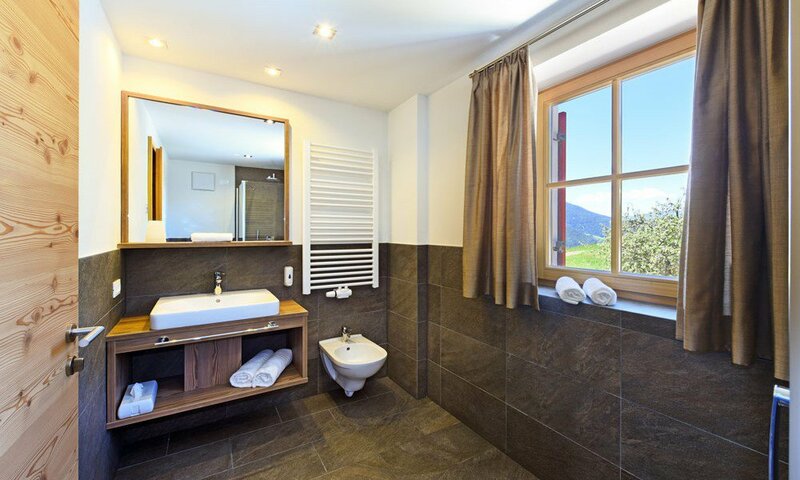 Each bathroom has a shower, WC/bidet, hair dryer, and convenient storage areas. family environment in our house will do you good, as we do not know any mass tourism and go to each of our guests personally. You and your family are always our focus! 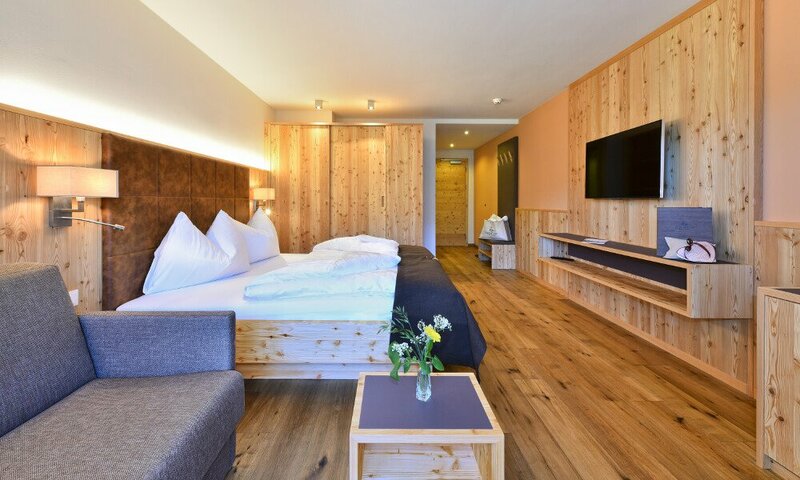 To make your time as pleasant as possible, we have furnished all rooms and suites in alpine style that flatters the senses with a lot of wood and warm colors. In addition to satellite TV and a safe, the rooms are equipped with free Wi-Fi access. They also serve you with the latest comfort. Please be aware that pets are not permitted with regard for the other guests. 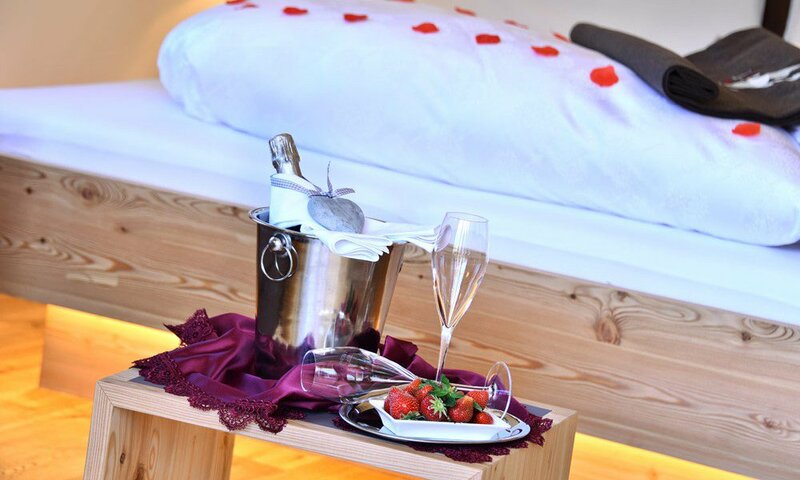 Would you like more information about our room offer or have you already made your choice? 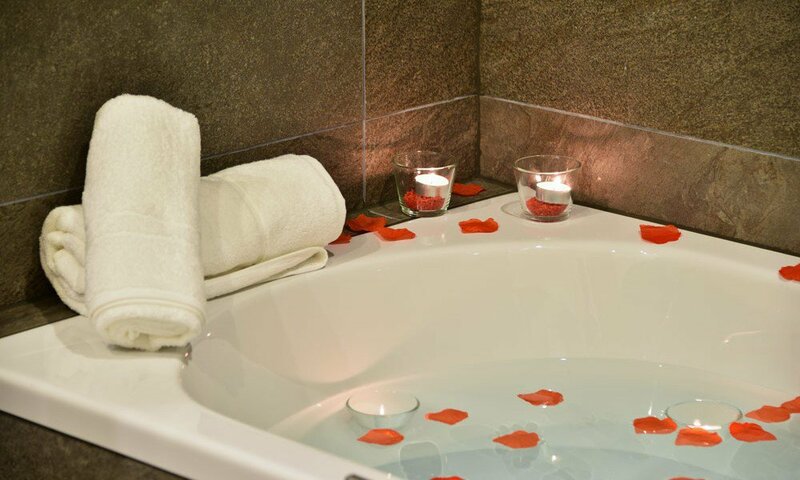 We are looking forward to your call at (0039) 0472 840003 or for your booking by e-mail. The prices are per person per day including gourmet half board for a stay of 7 nights. For shorter stays a small surcharge is charged. The tourist tax of € 1,20 per person per day will be charged separately. Children up to 14 years are exempt from this tax. We ask our guests to bring their own bath towels for the swimming pool. Deposit: We welcome written reservations via e-mail. The reservation will be confirmed once the deposit of 200 € per week has been paid. Up to 1 month before holiday arrival no cancellation charges, from 1 month before arrival or short-term departure we have to charge 3 days. Please pay cash on site. The cash limit in Italy amounts to 2.999,99 €. The following payment methods are allowed: cash, EC card, cash dispenser. Not allowed: checks. Arrival: On arrival day the apartment will ready for you starting from 2 p.m. Of course, you can also arrive earlier, but but the accommodations will ready for you only at 2 p.m. For arrivals after 5.30 p.m. we look forward to receiving a message from you. Departure: On departure day, please leave your apartment not later than 10.30 a.m. Other times are possible upon request. For the purposes of the GDPR, we inform you that your data will be used and saved exclusively for processing your application and will not be disclosed or distributed to third parties. Regarding data processing, you are entitled to all rights according to the GDPR. The holder of the rights is Andreas Mantinger – For more information about your rights, please visit here.